Taxi Horn Rental for George Gershwin's An American in Paris. 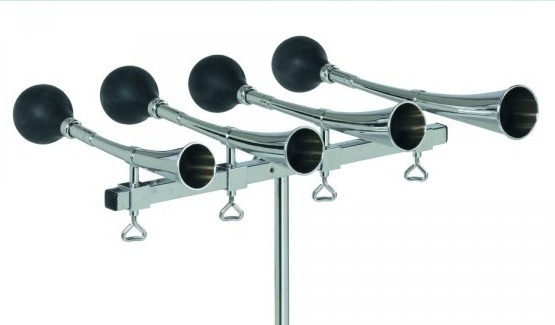 These tuned taxi horns come in a set of 4 pitches: A, B, C, & D. We have 6 sets of tuned taxi horns in our rental department and they all sound FANTASTIC! You will have no issues with our taxi horns; no muffled or dog barkish sounds, just pure taxi horn tone! As a percussionist for 16 years in the San Francisco Symphony, Trey Wyatt has used these horns for over 50 performances without failure. The taxi horn part is normally played by one player. Gershwin actually writes for 2 players to each play 2 horns. However, it works brilliantly for this part to by played by 1 player, the cymbal player, as the cues for all the taxi horn parts are written in the cymbal part. Rental Price: $100/week plus round-trip shipping. Short or Long Term tuned taxi horn rentals available. Call for Long Term Taxi Horn rental rates.